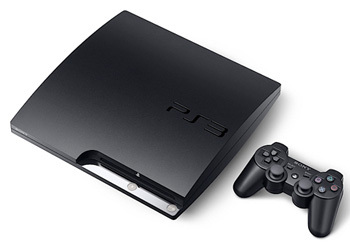 Hot on the heels of Microsoft rolling out support for Facebook and Twitter for the Xbox Live Gold subscribers, Sony has released firmware version 3.10 for the PlayStation 3 gaming console—and guess what? The update adds Facebook support. Once installed, the update adds a Facebook icon at the bottom of the XMB account management menu, enabling users to associate their PlayStation Network account with their Facebook account. Once that’s done, users will be able to optionally share in-game achievements and PlayStation Store purchases with their friends via automatic Facebook updates. Although the specific things that can be posted to Facebook will be up to individual game developers (and Sony itself, for its services) users will always have to approve posting, so purchases or activity a user doesn’t want to make public doesn’t have to be shared with the whole world. And that’s about the extent of the PS3’s initial Facebook support: users who want to check out their friends’ status updates can only do so via the PS3’s integrated Web browser. “This is just the beginning of our integration with Facebook,” said PlayStation Network Operations Director Eric Lempel, in a statement. “We are looking forward to adding new features enhancing the experience in future updates. 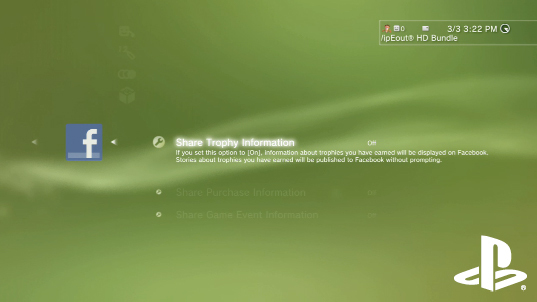 The firmware update also features a revised Photo category on the XMB (which enables users to see more photos stored on the PS3) and offers an updated PSN Friends list.